What I love about Boo is the simplicity of getting dressed in the morning. Oh, sure – he does have requests (“No jeans today, Mommy”) – but that is somewhat a given. Boys are easy to dress. Jeans, tees, running pants. Everything is pretty much mix and match, like Garanamals without the cute little tags. Give him “soft pants” (a.k.a. track pants) and a shirt (if it has a guitar, drums, tractor or construction truck on it, all the better) and he’s golden. I never hear a complaint from him, unless its getting dressed for church on Sundays. Pea – well, Pea is a very strong-willed girl. She knows exactly what she wants. (Or, if she doesn’t know what she wants, she’s quite certain of what she doesn’t want.) I’ve given up attempting to control her love of stripes. Don’t get me wrong, if I could get away with horizontal stripes, believe me, I’d wear them, but in the fashion world of a three year old, stripes go with, er, stripes. Color is irrelevant. Although, if there is any pink or purple in said stripes, its even better. The other thing I’ve given up on is the argument of when the wearing of a tutu or Princess dress is appropriate. Again, outside of church on Sunday, its up for grabs. Mind you, I’m the party responsible for her tutu-fetish – I make them, after all. I can’t claim all the responsibility for the princess dresses, as its Mimi who makes the annual trip to Disney World and comes home with the most beautiful – confections of dresses you’ve ever seen in your life. And she has a penchant for finding second-hand dress up clothes at yard sales. So yesterday when Pea decided – at 7am – that she HAD to wear her Sleeping Beauty dress, I agreed. After all, the cleaning ladies were coming later in the morning, so the first layer of glitter dropped by the dress would be eliminated. And wear it, she did – to run errands, to a playdate, to dinner, through and attempted nap. She wore it until about 7pm last night. Sucker mom caves. Sweet, thoughtful Pea points to a matchbox tractor trailer in the same display and said “You could get Sam dat!” Parenting fail. Yes, she went home with the doll. 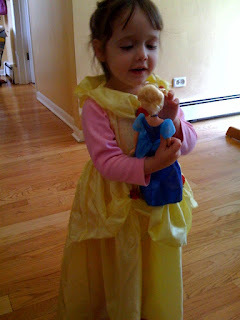 But if you could have seen how her eyes lit up as she chatted animatedly to the checker about her Cinderella, her Belle dress, how Mama got it for her (usually, anything well loved is attributed to Mimi, so I melted further), I couldn’t beat myself up too badly. She loves her new doll. 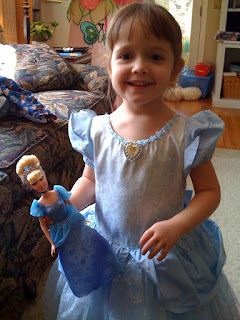 Of course, as soon as we got home, she decided she needed to wear her Cinderella dress so they could match. I don’t understand why. After all, like all her other Barbies, the poor girl soon ended up nekked as a jay bird. Miss M explained “we were running together. She runs faster without the dress”. That is the fastest nekked Cinderella Barbie you will ever see. Honest. Of course. Don’t we all? Long live girlie-girls, and all the accompanying accessories and accoutrements.